Danae Ruiz was nonplussed when a teammate’s mother spread the word Ruiz had been named to a National Association of Intercollegiate Athletics (NAIA) 2019 Division II Women’s Basketball All-America team. “I wasn’t prepared for that,” said Ruiz, a junior at Embry-Riddle Aeronautical University in Prescott. A 2016 graduate of Maricopa High School, she was a founding member of the ERAU women’s team. Now she is the first athlete from the women’s or men’s basketball teams to gain the NAIA nationwide honor. A guard, she was named to the NAIA Third Team. An annual leading scorer for the Eagles since her freshman year, Ruiz had a drama-filled season. She came out of the chute cold and couldn’t quite get her game together. Then she lost her starting spot. “It was a rough, bumpy road,” she said. Teams put more pressure on Ruiz than ever before, even staying in her face beyond the arc. New head coach Michael Trujillo decided she would fare better coming off the bench. She had to learn to take that in stride and just think about the playing minutes and not the starts. Despite starting only five of the 28 games this season, Ruiz led the Eagles scoring with 12.4 points per game, a total of 348. She let opponents come at her, resulting in 107 points from the free-throw line. It was her trademark way of getting back up and fighting, something she has been doing since at least freshman year of high school. 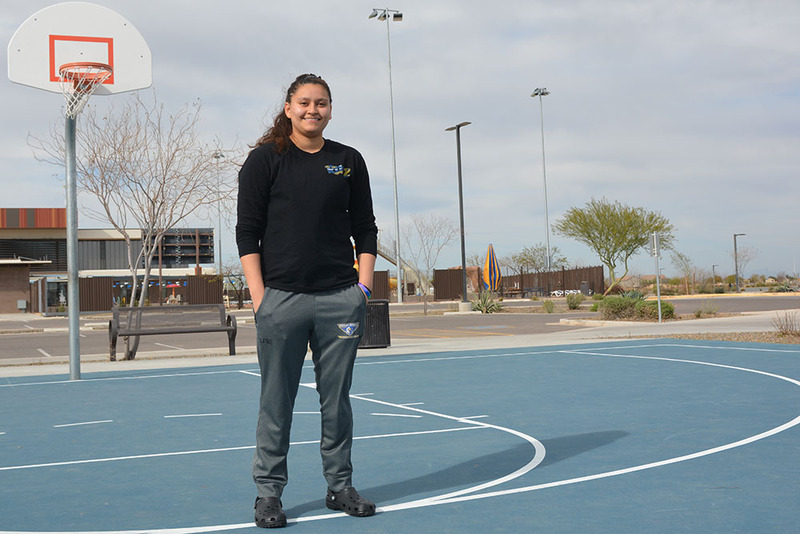 Before the family returned to Maricopa, she had a basketball coach telling her she would never play college ball or even be an impact player on high school varsity. By her junior year at MHS, Kati Burrows was the coach for a single season and guided Ruiz and the Rams to the state title. She also instilled a high-level work ethic that continued the next season under coach Melvin Mitchell and helped prepare Ruiz for the style of ball she would play at ERAU. She also credits her parents for “always encouraging me to keep going” in very different ways. Anna is the softie while Gabe pushes her to toughen up. This year Ruiz was again named All-California Pacific Conference First Team. For the first time, she was named Cal Pac Player of the Year. During the season, she scored her 1,000th college point. She is also on the ERAU Honor Roll as a forensic psychology major. Her college preparations had her enrolled in a variety of advanced-placement classes at MHS. At ERAU, she found the coursework a little easier than expected and found a way to balance classes and the travel demands of women’s basketball. She was even on track to graduate early but took on two minors to extend her time. The Eagles have become a sisterhood, Ruiz said, and she has been pushed into a leadership role, making sure the other women on the team are organized and on the same page. Those were not skills she had expected to acquire but are now part of her toolbox. While she has been on the path to a career in forensic psychology since day one at ERAU, she is also looking for post-college basketball opportunities overseas.